ETF welcomes this much awaited positive step in a long battle to have the law complied with, to restore dignity of professional drivers and to substantially improve their working and living conditions. Yesterday, the Advocate General of the European Court of Justice concluded publicly that weekly rest taken in the vehicle by professional drivers is in breach of the EU driving and rest time regulation. 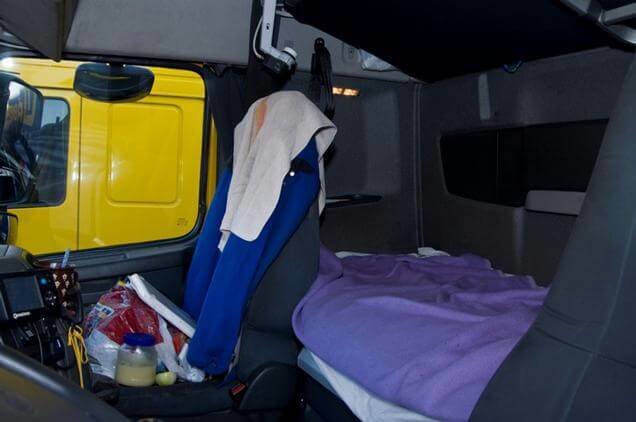 This comes in support of enforcement measures taken by Belgian authorities in 2014, against companies forcing their drivers to spend the 45 hours rest in the vehicle cabin. France adopted the same course of action as Belgium, at about the same time. The French and Belgian initiatives to enforce weekly rest legal provisions prompted considerable protests by hauliers, and a sudden change in the European Commission’s interpretation of rules, in favour of the industry. Weekly rest spent away from the vehicle has been at the core of the ETF fight against social dumping. For ETF there is no doubt that Regulation (EC) 561/2006 clearly stipulates that the weekly rest cannot be taken in the vehicle cabin. Demonstrations in Brussels targeting EU Institutions, opened letters addressed to the European Commission, EU ministers of transport and to the European Parliament and two trade union campaigns had the same message: road transport operators are responsible to organise the driver’s rest in the same manner and as assiduously as they organise their fleets and drivers’ working time. The European Commission intends to clarify the weekly rest rules as part of the road initiative. ETF will only accept one way to do that: the future rules must specify the conditions to be provided by road transport operators for the drivers’ 45-hour rest: a hotel or motel room provided with individual sanitary facilities and access to hot meals. Anything less than this requirement will be a way to legalise social dumping in road transport.